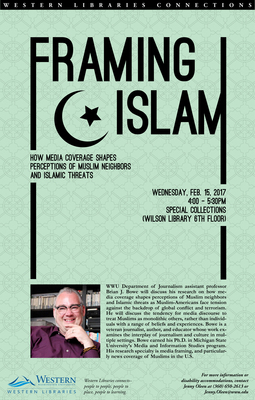 WWU Department of Journalism assistant professor Brian J. Bowe discussed his research on how media coverage shapes perceptions of Muslim neighbors and Islamic threats as Muslim-Americans face tension against the backdrop of global conflict and terrorism. He discussed the tendency for media discourse to treat Muslims as monolithic others, rather than individuals with a range of beliefs and experiences. Bowe is a veteran journalist, author, and educator whose work examines the interplay of journalism and culture in multiple settings. Bowe earned his Ph.D in Michigan State University's Media and Information Studies program. His research speciality is media framing, and particularly news coverage of Muslims in the U.S.
Bowe, B. J. & Hoewe, J. (2016) Night and Day: An illustration of framing and moral foundations in the Oklahoma Sharia amendment campaign. Journalism & Mass Communication Quarterly. Bowe, B. J. & Makki, T. W. (2015) Muslim neighbors or an Islamic threat? A constructionist analysis of newspaper coverage of mosque controversies. Media, Culture & Society. Hoewe, J., Bowe, B. J., & Zeldes, G. A. (2012). Using a Wiki to Produce Journalistic Best Practices. Communication Teacher, 26(1), 22–32.